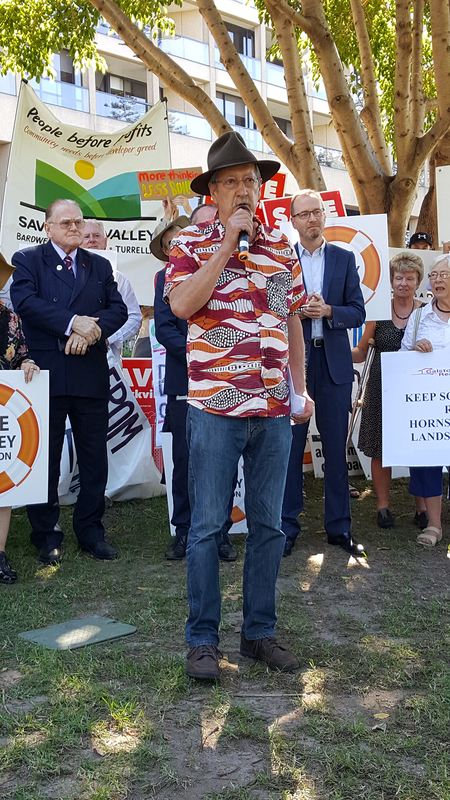 A coalition of organisations opposing the destruction of Sydney by developers was launched under the Tree of Knowledge, behind NSW Parliament in Sydney’s Domain on Thursday, April 12. Actor Michael Caton, famed for his role as a suburbanite galvanised into action to save his home in the film ‘The Castle’, began the launch of Save Sydney Coalition with a reference to Barcaldine’s Tree of Knowledge. At Barcaldine in 1891, striking Queensland shearers swore the Eureka Oath, ‘to stand truly by each other and defend our rights and liberties’. She said, “Whole suburbs, that have been in existence for over one hundred years, with the subdivisions dating back to the 1800s and early 20th century,” are being destroyed. “The Save Sydney Coalition seeks to protect local character of the entire Sydney region”. Windsor is part of Greater Sydney but 50 years ago was still country town, 56 kilometres northwest of Sydney centre. Now it’s an outer suburb. The Battle for Thompson Square and Windsor Bridge broke the Guinness Book record with a five-year picket against development. The square was established in 1795 and named Thompson Square in 1811. Residents are fighting a proposal that will “replace our historic bridge and cut a path through the oldest public square in Australia. Currently we have approximately 3000 trucks a day.” These are B-doubles or bigger, and with numbers predicted to rise to 5000 daily she stated. 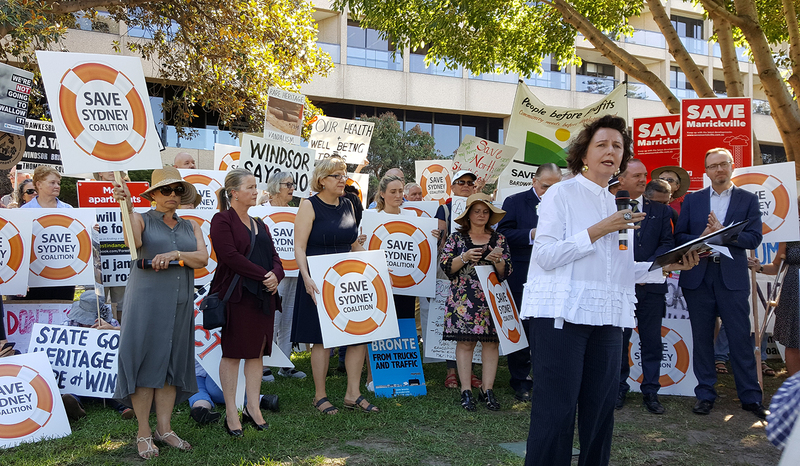 “It’s like a road going through The Rocks with 5000 trucks a day” bringing sand from sand mines, for all Sydney’s developments, Jan Sparks said. He outlined three struggles. In south Dural, a proposal had over 6000 objections. 600 people also joined a community meeting to stop 240 hectares of land being destroyed, with massive houses to be built. RIPA is now fighting Mirvac’s plans for the IBM site next to Cumberland State Forest, with 3,500 objections, he continued. The forest, where the National Trust and community replanted over 40,000 indigenous plants beginning 30 years ago, is some of the last blue gum forest in Sydney. The development cuts into the forest, including Powerful Owl habitat. Save Sydney is aiming to systematically broaden its membership, with affordable housing a key demand. Attempts have been made to link up with those fighting public housing evictions.